For the uninitiated (myself included before working with Paul on this project), VMT stands for Vehicle Miles Traveled. I finally put it up on my wall of inspiration today! This entry was posted in Uncategorized on June 16, 2014 by Zia. The GeoJSON coordinates here are WGS84. Inspecting the DOM for one of these paths after rendering shows that the SVG path has only the required 4 data points and is closed by the “Z”. Here the values are SVG coordinates. I wrote the following function to calculate the top center position of the rectangle, for the purpose of positioning the tooltip. In the end I didn’t like the tooltip moving all over the screen and obstructing the map, so I used a statically positioned data table that updated on mouseover. Even though I didn’t use it, the approach above was so much better than positioning based on the mouse and obstructing the region of interest that I thought I’d share it anyway. This entry was posted in Visualization on April 22, 2014 by Zia. Update: We won the category Best Analysis! Together with Paul Schimek and Kim Ducharme, I submitted an entry for the 37 Billion Mile Data Challenge. MAPC made available transit data on MA driving from the DOT from 2008 – 2012. They also divided the state into ~15 acre grid cells (250mx250m), for which they provided information on driving, estimated C02 emissions, land use metrics, school accessibility, population from the 2010 census. I created an interactive map to explore this data statewide aggregated at the zip code level and also at the 15 acre grid cell level. Paul ran a multivariate regression model to explore possible explanatory variables independent of other effects. Kim provided excellent styling assistance as always. The map is amazingly interesting to explore: down to the neighborhood level you can explore population density, average income, jobs, transit access, miles driven per day per person and more. Check out the live version to explore the interactive map. If you are interested you can take a look at the other submissions for the challenge and vote for your favorites. This entry was posted in Visualization on April 20, 2014 by Zia. d3 compare function gottchas, don’t try to use any information not bound with your data! I ran into an interesting problem updating a legend rendered with d3 today. I am displaying different data sets on a map and adjusting the colors and cutoff values based on what variable is selected. The image below shows two example states of the legend, the third is the unexpected result when I transition from the first to the second and the “200-300″ case fails to update. This entry was posted in Uncategorized on April 17, 2014 by Zia. Here are the relevant bits of code (note I am using d3 and jquery), positioning the tooltip relative to the cursor. There are two cases I’ve used for positioning the tooltip, either using page coordinates, or svg coordinates. The former, shown above, is best for adding a tooltip on a path (for example a data line), where you want the tooltip to be where the mouse is mousing over the line. The latter approach (svg coordinates), is best when you want to position the tooltip relative to the element you are mousing over, for example, directly above or to the right of an svg:circle. That’s the idea anyway. There are so many ways to approach tooltips. I just wanted to share what is working for me at the moment. This approach works well if you don’t want a drop shadow on the tooltip, if you want a border of some sort, then you can use an image instead of the css triangle as was done in the NYT article mentioned above. This entry was posted in Visualization on April 15, 2014 by Zia. I am looking into using d3 in conjunction with Leaflet and worked through Mike Bostock’s tutorial on d3 and leaflet. Using the MAPC provided shapefile for municipalities, so far it seems really slow on zoom, I think because of the super high resolution shapes being recalculated. 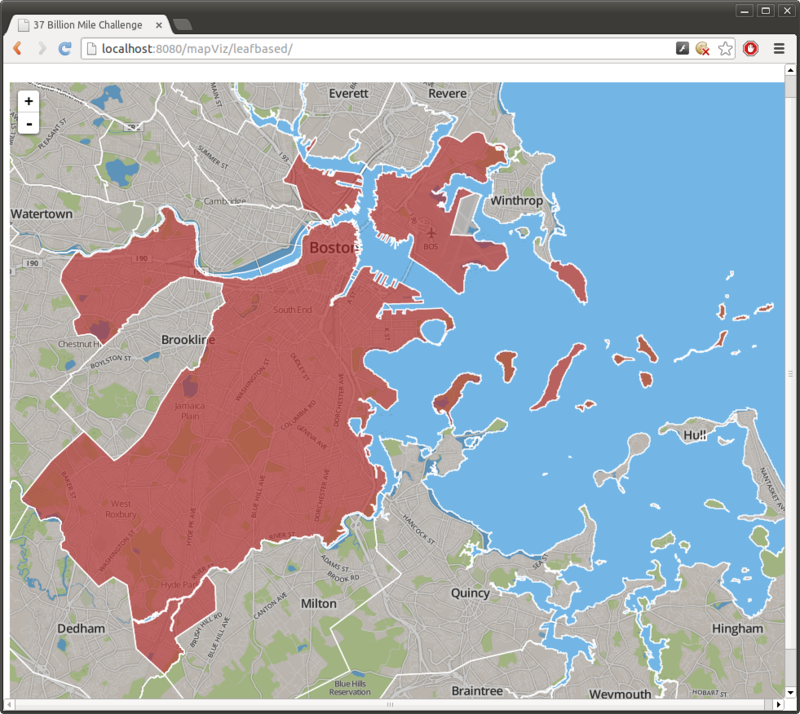 Check out the shape of Boston! The tiny sliver in of Boston that extends into Everett! This entry was posted in Uncategorized on April 8, 2014 by Zia. Turns out the problem was the wrong projection. The MAPC data (or most of it) is using the NAD83(HARN)/Masssachusetts Mainland EPSG:2805 (QGIS reports this), also known as, “NAD_1983_StatePlane_Massachusetts_Mainland_FIPS_2001″ from the .prj in the shape file. Apparently, pyshp doesn’t handle reading the .prj files very well, it kinda ignores them on purpose (https://code.google.com/p/pyshp/issues/detail?id=3). So using pyshp to convert the shapfiles to GeoJSON probably wasn’t a good choice (no projection info will be transferred to the GeoJSON). 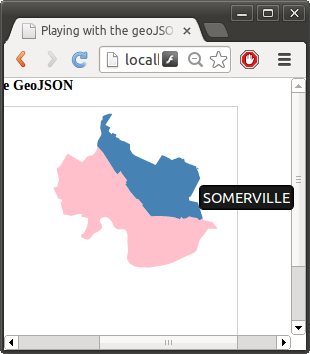 GeoJSON allows for specifying a CRS, but assumes use of the default of WGS84 if none is specified according to the spec. 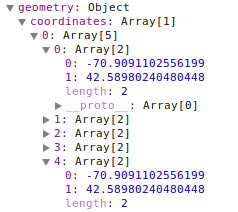 I tried to explicitly set the CRS in the geoJSON, but that doesn’t seem to be working, it looks like the d3 code is ignoring the “crs” property and assuming WGS84 as well. However, saving the layer as an ESRI shapefile you can change the projection using QGIS. At this point really what is the point of using any tool other than ogr2ogr? 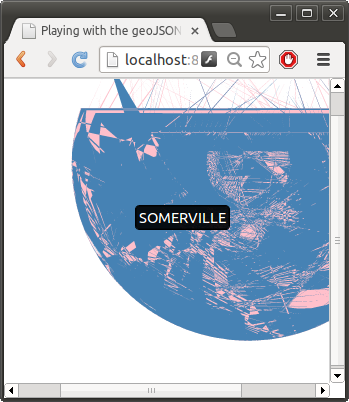 For example, the following command converts the Massachusetts municipalities shape file to GeoJSON, reprojects it correctly, and filters out all the cities except cambridge and somerville. All in one command and it does it correctly (although ogr2ogr doesn’t seem to put crs info in the geojson either, so I’d stick with WGS84 as much as possible). This entry was posted in Uncategorized on April 7, 2014 by Zia. To accomplish this rudimentary image I converted the provided shape file to GeoJSON in python using the pyshp library, filtering out records with no data. This code is based on an example by M. Laloux, modified to use an iterator over the records and drop any with no data (here I am using “mipday_phh” as a proxy for no data). I then opened the file in QGIS (Why did I convert it to GeoJSON you ask? Because I am planning to work with it in d3 next). With QGIS I can’t see the grid color by default because it is overwhelmed by the default black border on each shape. This post discusses how to remove the outline. I ended up using the last option (the old Symbology), but what a pain! Besides the difficulty of working with such large files (did I mention with all the yak shaving I am doing here I got a bigger hard drive too?). The grid data is also awkward to link to other data sets, which more typically use zip code information. (Update: The companion data set Tabular section includes zip code information for the centroid of each grid cell). Since the grids are regular, many span multiple zip codes/municipalities. Furthermore, addresses were mapped to grid locations based on estimates of street location, so for some rural areas some data was mapped to the wrong grids etc. Regardless of those challenges, the pictures below show clearly that driving patterns vary greatly within a city or zip code. Here are a few plots looking at the data in QGIS showing Miles Per Day per Household, where the blues are under 35 miles per day, yellow around 75 and orange is over 100 miles per day. It’s a horrible viz, but I can’t bring myself to spend time on the color config in QGIS (way too painful). 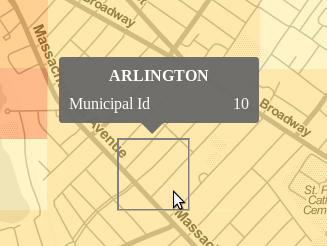 Note the municipality boundaries shown are drawn from a separate shapefile layer provided by MAPC. The same image is shown below zoomed in on the Boston area. There are unsurprising large swaths of long distance car commuter communities ringing the city. I included a legend here FWIW, the colors were picked manually from the QGIS color picker (which leaves a bit to be desired), hence the abysmal scheme. The divisions were automatic using the equal bin option. This data is clearly flawed! We can see from the legend that there is at least one grid cell with an average of over 6 thousand miles a day! I screen grabbed this legend from the layers toolbar in QGIS and gimp-shopped it in for your viewing pleasure. Next up, working on a workflow for rendering nice images and figuring out what data and stories to tell. 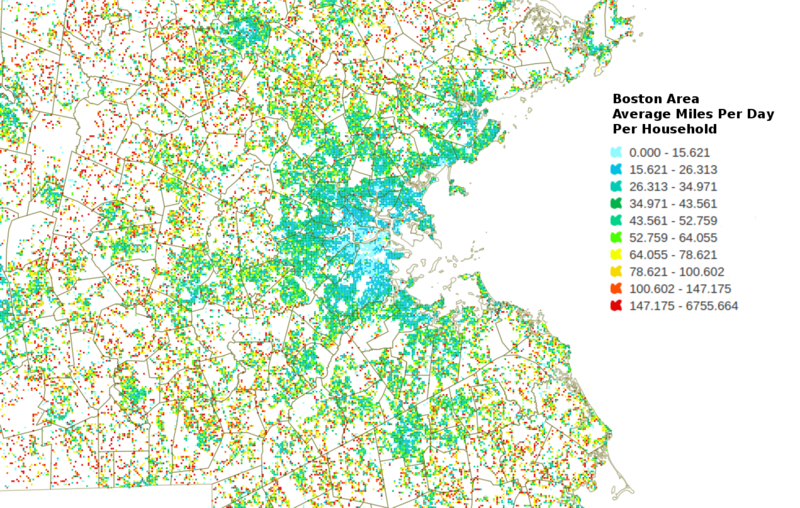 Data used in this post was provided by Vehicle Census of Massachusetts, Metropolitan Area Planning Council 2014 and licensed under a Creative Commons Attribution 4.0 License. This entry was posted in Maps on April 5, 2014 by Zia. MAPC and the Mass DOT recently released data from the Vehicle Census of Massachusetts for use in the 37 Billion Mile Data Challenge. I am just warming up with the data, so I thought I’d take a look at some simple questions. 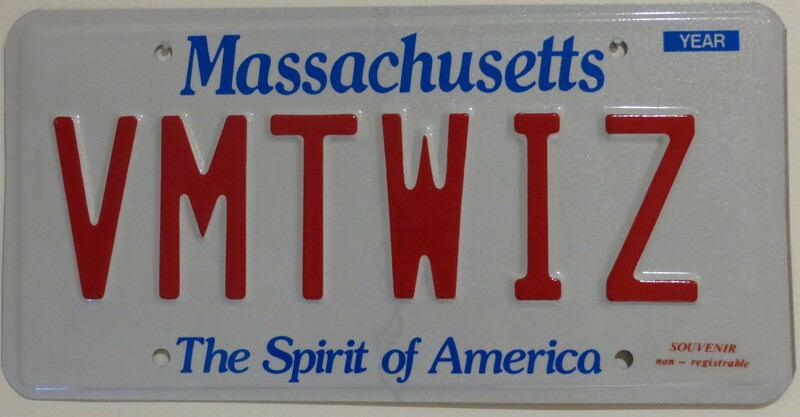 I’d love to look at something of personal interest, like MIT solar cars (back in 1999 we registered our three wheeled flying saucer as an “experimental motorcycle”) or the Solectria Force (since I wrote software for the Force when I was working at Azure Dynamics). Unfortunately, these vehicles are among the thousands in the dataset that have no manufacturer information because they were not part of the commercial database used to decode VINs on the dataset. Although, to be fair, there are over 230 different makes identified. Besides the solar car didn’t even have an odometer. So how about investigating the Deloreans of Massachusetts? Have you ever seen one on the road? I saw one in Cambridge some years back… I wonder what the story behind it was. Did you know they made gold plated Deloreans? Pretty cool, but according to Wikipedia the remaining ones are all in museums. 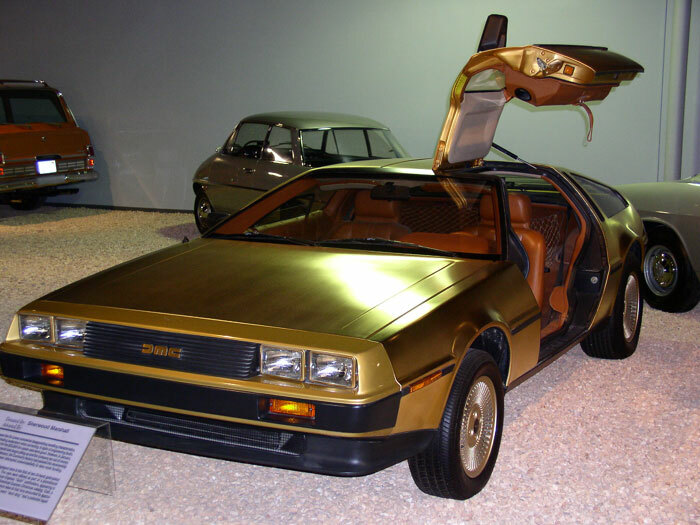 1981 24 karat gold plated DeLorean. William F Harrah Foundation National Automobile Museum in Reno, Nevada. Photo via WikiMedia released under a GNU Free Documentation License. There were 20 Deloreans registered in the state of Massachusetts between 2008 and 2011. According to Wikipedia there are approximately 6,500 vehicles still existing. 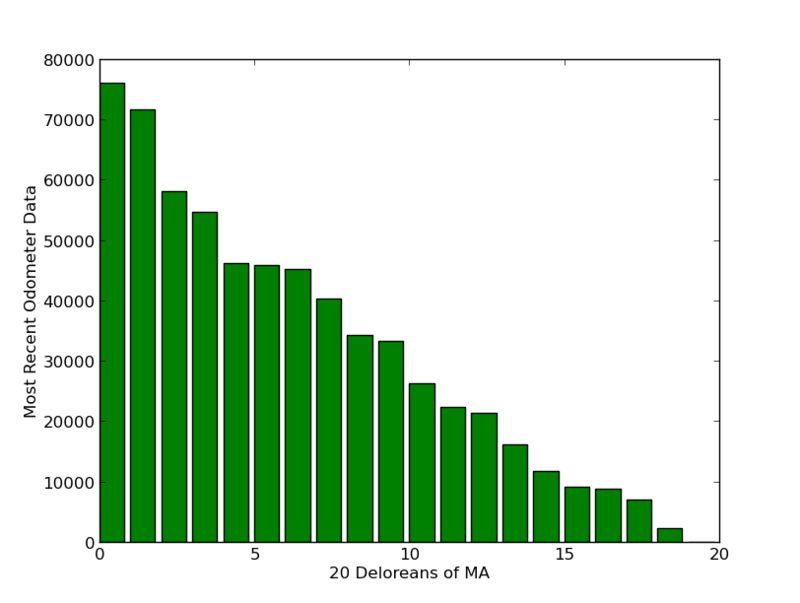 Which means MA accounts for ~0.3% of the surviving Deloreans. Of these, 12 were manufactured in 1981, 7 in 1982 and 1 in 1983. I posit that most of these vehicles are being happily garaged and protected from the elements. Not unexpectedly, they are all relatively low mileage vehicles for 30+ year old cars. One data point, where the data is starting from 2007 and there is only one odometer reading for that vehicle of 40350, which seems have been credited entirely to the 403 day period between inspections, resulting in an outrageous 102.69 mile per day average. In another case it looks like the ten-thousandths place was mis-entered by the inspection station (can’t really blame them, they are inspecting a Delorean afterall). So an extra 30,000 miles is being credited for a 394 day period (which accounts for 76.14 of the average daily miles reported). Correcting for this error brings the miles down to a reasonable 0.89 miles/day. It was interesting when looking at the average daily miles to note that of the 64 records for these 20 vehicles, 25 have unavailable odometer data and therefore report a daily mileage of zero. Another two had the obvious errors discussed above. Who knows what the fidelity of the rest are or how this reflects the total data set. Clearly the data isn’t perfect, but the image below seems to indicate there are a few people regularly driving their Deloreans. 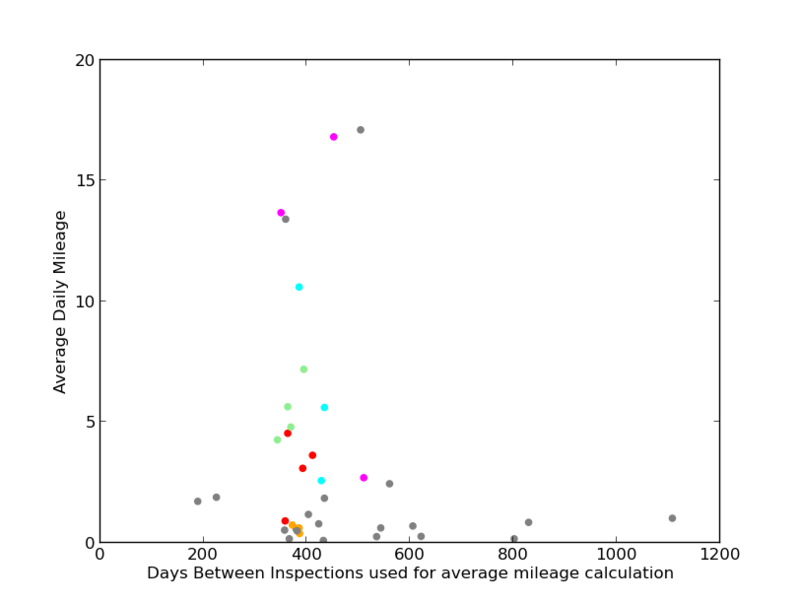 After discarding data as discussed above, I plotted the average daily mileage and the days between inspections used to calculate the average for the remaining records (37 of them). I colored data points for a few vehicles that seemed to show consistent behavior. 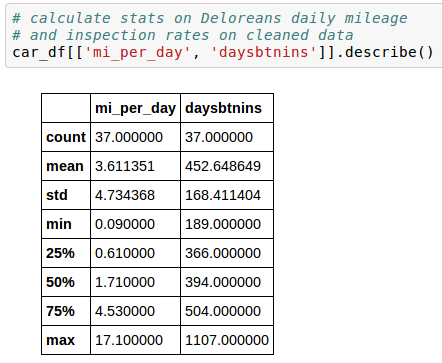 You can see a common inspection interval around 400 days (Delorean drivers push their inspections to the end of the month+ just like the rest of us). The consistency between years for many of the “higher” average mileage vehicles indicates those numbers are real and there are probably a half dozen or more Deloreans doing a daily commute in Massachusetts! A few vehicle’s data is colored to show consistent average daily mileage and regular inspections for those vehicles. It looks like a few Deloreans in the state were used pretty regularly from 2008 – 2011. More than half of the data points are doing less than 2 miles per day of driving, but hey, my car sits about that much too. This entry was posted in Visualization on March 24, 2014 by Zia. Do you want to animate a line so that it looks like it is being drawn on the screen? At a first pass you might think this would be difficult, for example requiring you to draw in the path piecemeal like this: https://groups.google.com/forum/#!topic/d3-js/pWOfEThcnIg Ugh! However it turns out it is trivial if you use the svg stroke properties: stroke-dasharray and stroke-dashoffset as demonstrated in this bl.ock and discussed below. The trick is to understand how the dasharray and dashoffset work. The dasharray is a list of lengths that specify alternating dashes and gaps, starting with a filled section (you can create all sorts of dash-dot patterns). The offset shifts the pattern start point to the left. Here is a quick example I drew in Inkscape, as an experiment in exploring SVG through an SVG drawing program. 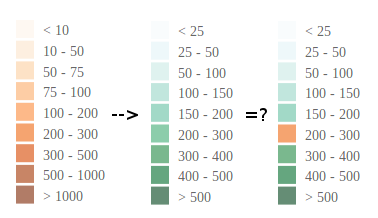 I was disappointed that the concepts here are abstracted away by the GUI (might as well be drawing it in Word), but by inspecting the output svg file I was able to determine the values being used in the image below for the stroke-dasharray are “48,48” and the stroke-dashoffsets are “24” and “48”. For this example only the ratios are relevant. Calculate the length of the rendered line (or bigger works too for this example), call it lineLen for this example. Initialize the line with a stroke-dasharray of “lineLen, lineLen”, so the filled dash and the gap are each greater than or equal to the length of the line. Initialize the stroke-dashoffset to “lineLen” so that the pattern will start with a gap (your line will start invisible). Transition the stroke-dashoffset to zero, this will cause the pattern to shift to the right, revealing your line from the left to the right (moving from the bottom up in the example above). Here is the key bit of code, assuming you know some d3 and have some “data” and a “line” defined for it. I used this trick to draw a line on the screen as an enter animation on recent project and loved the simplicity of the solution. This entry was posted in Uncategorized on February 26, 2014 by Zia.